As award winning foreign correspondent, Dr. Ruth Gruber, reaches her 96th year this year, her new and 19th book is out. The book, “WITNESS – One of the Great Correspondents of the Twentieth Century Tells Her Story,” crosses decades as it speaks of humanity, crisis and rescue. Just released by Schocken/Random House Books, “WITNESS,” maps in carefully carved descriptions the Arctic towns of the 1930s, the casualties of Hitler’s regime in the 1940s and the resettlement of the Jewish refugees in the decades following World War II. In 1935, Ruth’s world in journalism was expanding as she received, at the age of twenty-four, permission from one of Stalin’s Soviet gate-keepers to enter the Arctic region as a foreign correspondent. Only four years before, Gruber was celebrated as the youngest doctorate in American history at the age of 20. On entry to the northern Arctic, Gruber saw what few western journalists had ever seen up to that time. It was the inner life of the prisoners of Stalin’s gulags in the isolated regions of Siberia. As the gates of the region were opened to her, words spread among Ruth’s associates, “My journalist friends began showering me with sweaters, scarves, long underwear, mittens, wool hats and even a hot water bottle,” she wrote. The trek would not be without risk and daring. Leaving on her trip to the Arctic Ocean, north from Moscow, Ruth grew that day as a correspondent and cultural archivist as she carried her small Hermes typewriter along with her notebooks. She would find the travels never to be boring. As she archived the journalist’s “who, why, what, when, where” Ruth wrote her impressions as a journalist first and a woman second. Her ability to reach the heart of everyone she met helped her immensely. She was likeable and honest and took copious notes. “We want you to write a four part series about the Soviet Arctic,” said Gruber’s boss and mentor, Helen Rogers Reid, owner of the well-known and respected, “Herald Tribune” newspaper. “Ruth, you’ve scooped the world,” added Reid. There would be many more scoops throughout the years as Gruber worked closely with Reid on assignments. It was enough to be a journalist in those years, but even more to tackle this as a woman journalist surrounded by men. Everywhere Ruth went she ignored the grand attention of the men and followed her story. She looked closely into the eyes of those she would interview. Later, Ruth went on to write about Alaska, covering the lives of the Eskimo/Inuit people. Often Gruber would surround herself with mothers and children who would sit with her as she jotted down words in her notebook. As she took out her camera she focused first on the eyes then on the environment as the key element of the story. In the years that followed, Gruber’s career would take her to many more journeys. By luck or fate she would later become, in 1942, special assistant to the U.S. Secretary of Interior, Harold Ickes. In 1944, Ruth would be in the right place at the right time. By miracle and provenance she would get her chance to jump in personally to help save the war refugees of Europe. “In January 1944, President Franklin Delano Roosevelt made a startling announcement; ‘I have decided that approximately one thousand refugees should be immediately brought from Italy to this country,” Gruber wrote. The government had long held silent on the issues of the Jews under the vast direction of Breckenridge Long, who as Assistant Secretary of State, had barred nearly all incoming visas to all Jewish refugees. Now by order of the President, Ruth Gruber would be involved in another large chapter in world history. In short time Ruth was brought into the project as she was briefed by her boss, Harold Ickes, and told to get ready for the assignment. This wasn’t the first time Ruth would face life or death. Flying on her days in the Arctic and in Alaska she had faced other similar dangerous moments. Moments when it was questionable whether or not her plane would make it to its destination in heavy fog or under the hand an Alaskan pilot who regularly flew the terrain without a map. Now Gruber was being given a chance to help the world. The opportunity ran through her veins like fire. Her ability as a journalist would come in handy. She spoke several languages, especially German fluently. She boarded an Army Air Force plane with her camera bag, notebooks, typewriter and suitcase full of summer and winter clothes. In her heart there was a world out there that needed saving. In “WITNESS,” each chapter, each true story, unfolds one upon another like a skyscraper that reaches toward the sky in strong and concentric layers. Just as the epic story of Homer is told in “The Iliad,” Gruber tells us history up close, as it should be told, with a personal and direct connection to the heart. The gift in her telling is that Ruth Gruber doesn’t hold back. In a life reached through decades of over 95 years Gruber has learned that holding back is not part of the better equation. 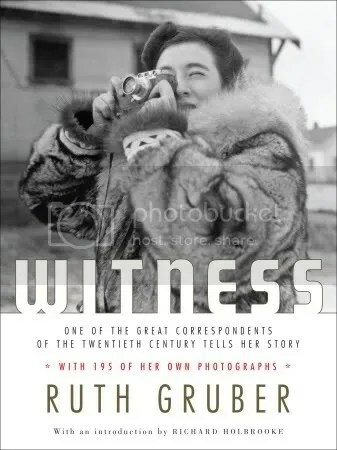 “WITNESS” is full of 190 of Ruth’s historic photographs. Each one shows an era, a time gone, a moment of intensity. Many of these photos have never been published before. These are images taken on the great plains of Siberia, in the homes of the Eskimo/Inuit of Alaska, in the crucial moments during the rescues of Jewish refugees from locations in Europe, Yemen and Iraq or the grueling British-run DP camps in Cyprus after the war. The images don’t lie. Humanity is exposed here for its own sake. It’s own beauty. Lys Anzia, a 2006 Pushcart nominee, is an American historical playwright and humanitarian journalist writing news features for international women’s advocacy through WUNRN and UN-INSTRAW for United Nations agencies and affiliates. She is founder/editor-at-large for Women News Network – WNN.